Ben & Jerry's is stuffing ice cream into bagels now because why not? These limited-edition treats are actually named after a catchy 1990s hit song. All right, stop, collaborate and listen, Ben & Jerry's is back with a brand new invention. OK, our rapping skills might not be super cool but this ice cream treat definitely beats the heat. If the Vermont-based creamery is good at one thing (besides making ice cream, obviously), it's giving their products clever names — and the company's new, limited-edition creation is no exception. 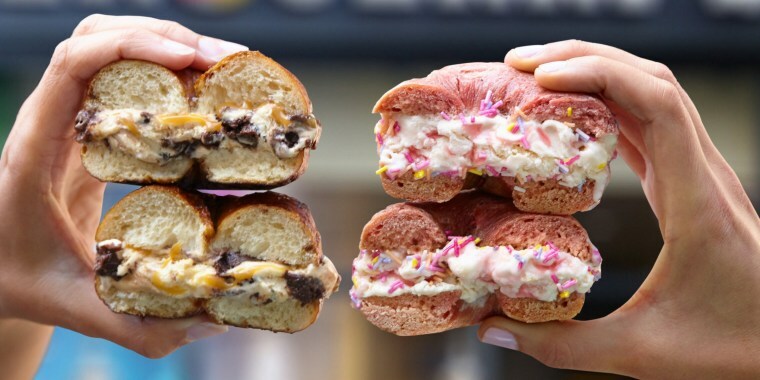 Ben & Jerry's announced it will be serving ice cream bagel sandwiches ... and they're called "Ice-Ice-Bagels." But, of course, there's a catch. The sweet treats will only be available at scoop shops in the U.K. Many people love cookie dough in all of its forms but the idea of ice cream sandwiched between a breakfast pastry has people equally delighted and totally repulsed. This tweeter is in favor of flavor. I need to like this more than once. Some can't get the craving off their minds. Other's won't even give the bagels a chance. And some just feel queasy at the thought of mixing ice cream and bagels. The "Montreal-style bagel[s] with notes of maple syrup" are sourced from Bross Bagels and come in two flavors. The Birthday Bagel has Ben & Jerry's Birthday Cake ice cream (vanilla cake batter ice cream with pink frosting, strawberry swirls and bits of cake) sandwiched between a "chewy pink bagel" with sprinkles. The "Holey Cara-moley" pretzel bagel satisfies both sweet and salty cravings with scoops of Double Caramel Brownie ice cream smothered in caramel sauce. So why tease the world with a snack that only available in one country? Because breakfast and dessert is the best combination ever, obviously. Waffles and ice cream. Nutella french toast. Ben & Jerry's Cereal Milk Ice Cream ... need we say more? The truth behind the combination is actually a pretty sweet story, though. According to Ben & Jerry's, this new treat actually pays homage to "what might have been," as company co-founders Ben Cohen and Jerry Greenfield had their sights set on the bagel business before deciding to open their first ice cream shop in 1978. Boy, are we glad they did.